Jurors have been showed footage from the moments of the Shoreham Airshow crash which left 11 men dead. 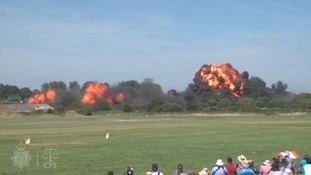 Pilot Andrew Hill was performing a stunt in a 1950s Hawker Hunter when it plummeted onto the A27 in West Sussex and exploded into a fireball at 1.22pm on August 22, 2015. The 54-year-old is standing trial at the Old Bailey after denying 11 charges of manslaughter by gross negligence. On Thursday jurors watched never-seen-before footage from the cockpit of the plane as relatives of the victims sat quietly in the packed public gallery. The court was told footage from the GoPro camera, positioned behind the pilot's seat, showed Hill performing a flypast parallel to Shoreham Airport’s runway, inverting the aircraft showing the land below and then performing a stunt called a Derry roll. The A27 comes into view before the camera shows the sky as Hill begins the fatal loop manoeuvre. Wearing a helmet, Hill can be seen moving during the flight and nothing can be heard other than the sound of the engine before the aircraft beings to judder, flying low along the road and crashing. Tom Kark QC, prosecuting, previously told the court the crash was "purely" because of "pilot error" after the aircraft was flown too low and too slow. Although normally a careful and competent pilot, the court heard of some past incidents where he had played "fast and loose" with the rules and appeared to have a "cavalier attitude" towards safety. After showing the footage, Mr Kark told jurors there was a "catalogue of errors" on Hill's part, including that he failed to take evasive action to carry out an escape manoeuvre. Jurors were also shown footage shot by spectators at the side of the road which shows the plane in the sky performing the stunt and crashing into the main road, engulfing victims who were in cars and standing nearby. Hill, of Sandon, Buntingford, Hertfordshire, watched the beginning of the footage but lowered his head in the dock when the moment of impact was shown before looking at the jury. Immediately after the crash he told emergency services he did not remember or know what happened but felt "terrible" and had been feeling unwell, the court heard. Mr Kark said: "The aircraft crashed as a result of Mr Hill’s negligence and as such this breach of duty caused the deaths of 11 men. "Having regard to the serious and obvious risk of death, the negligence of Mr Hill was truly exceptionally bad such as to amount to the criminal offence of gross negligence manslaughter." He said exposure to G force was "routine" for any experienced pilot and that cognitive impairment was different to the temporary effects of G force, adding: "If a pilot continued to fly an aerobatic display above a crowd of spectators, knowing that he was unwell, then that, we would suggest, would be capable of amounting to a gross breach of his duty of care." But Karim Khalil, defending, told jurors criticisms made of Hill – a Royal Air Force instructor and British Airways commercial captain – were "either wrong or misplaced". He said Hill had no memory of the crash and "may have been suffering cognitive impairment", adding: "He was subjected to the increasing forces of gravity." The court heard he was left with serious, life-threatening injuries and that his life was saved by being thrown from the plane after which he was placed in a medically induced coma. He said it would be a "remarkable pilot indeed" who had never made an error and that Hill responded to making any mistake in a "respectful" manner and was keen to ensure it did not happen again. The victims are Maurice Abrahams, 76; Dylan Archer, 42; Tony Brightwell, 53; Matthew Grimstone, 23; Matt Jones, 24; Graham Mallinson, 72; Daniele Polito, 23; Mark Reeves, 53; Jacob Schilt, 23; Richard Smith, 26; and Mark Trussler, 54, who all lived in Sussex.